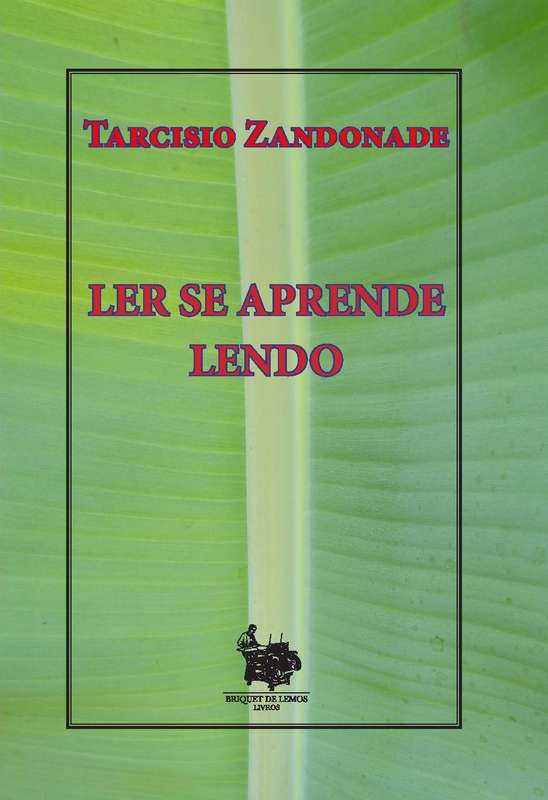 Editor’s Note: Tarcisio Zandonade kindly provided a précis of his book Ler Se Aprende Lendo (Reading is Learnt by Reading) to the SERRC. If you are interested in Zandonade’s book, in Portuguese, please contact Jim Collier (jim.collier@vt.edu). In addition, please refer to “Information as Recorded Knowledge”, Mara Cristina Salles Correia and Tarcisio Zandonade, and “Social Epistemology from Jesse Shera to Steve Fuller”, Tarcisio Zandonade. Image credit: Briquet de Lemos / Livros. Major Brazilian publisher in the area of Library and Information Science, Briquet de Lemos / Livros, has recently launched a new book by Tarcisio Zandonade, Ler se aprende lendo, aimed at promoting reading proficiency to young Brazilians. The e-book is available for download at www.briquetdelemos.com.br for fifteen Brazilian reais. The author argues that most Brazilian public schools are unable to properly teach literacy because youngsters are not provided with books from the onset of reading, soon after learning how to recognize alphabetical symbols. In Brazil, despite recent federal regulations requiring a legitimate school library in any basic education institution, managed by a professional librarian, many public school systems are postponing compliance to this legal requirement, delaying the provision of books for students and teachers, due to official misinformation about educational priorities or, even worse, lack of political willpower. The main principle supported in this book is that the school library is a fundamental member of the school organism. A school without a library is incomplete and becomes an institution without memory. Consequently this deficient school will never be able to actually educate its students, nor update its teachers. Reading and writing proficiency is the major requirement for a citizen to reach a worthy active position in society, and the educational system has the duty to provide the means to achieve full citizenship. In Brazil, after the consistent failure of an alarming percentage of young students in national and international reading and writing tests, many educational critics have called for ‘reading appreciation’, but conclude plainly that “Brazilian students know how to read, but they do not understand what they read”. Very few, however, search for the real cause of this failure. Another conviction supported in this work is that for reading and writing to be appreciated, one should teach the origins of the art of reading and writing, developments of the acquisition of language, through which “the phenomenon of knowledge, the major miracle of our universe” is cumulated in the human mind. To be able to appreciate reading, the apprentice is certainly motivated by understanding the optical and neurological process of reading. Reading and writing are arts that can only be perfected through ‘reiteration’: the more you read, the more you learn to read, and learning is learnt mainly by constant and methodical reading and writing. The more you read and write, the more knowledge is amassed. Reading is a complex process that is defined as “usually the visual aspect of learning, and contains… seven steps”, as clearly explained by Tony Buzan, in his internationally appreciated work Use your head. Buzan defines these seven steps as: (1) recognition, the reader’s knowledge of the alphabetic symbols; (2) assimilation, the reflexion of light from the word, received by the eye, then transmitted via the optic nerve to the brain; (3) comprehension or intra-integration, consolidates all parts of information being read; (4) understanding or extra-integration, the reader merges the captured information with all previous knowledge in his mind; (5) retention, the storing of information – or memorizing – in the reader’s mind database; (6) recall, the ability of the reader to retrieve from memory the information whenever s/he needs it; (7) communication, the main function of language, i.e., the interpersonal knowledge usage. Reading and writing are crucial techniques to be studied by information science, since information is the process of recalling the content from a document by making sense of a sequence of graphic records or text. After examining the process of reading and writing, we come to three vital educational principals for the acquisition of knowledge by reading and writing books and other documents: (a) reading is learnt by reading; (b) writing is learnt by reading; and (c) knowledge is acquired mainly by reading and writing. Zandonade, T. Ler se aprende lendo. Brasília, DF: Briquet de Lemos / Livros, 2015. www.briquetdelemos.com.br. Law Nr. 12.244, May 24, 2010, ordering the universalization of libraries at educational institutions in Brazil. Popper, R. K. Objective knowledge: an evolutionary approach. London: Oxford University Press, 1972. Buzan, Tony and James Harrison (consultant editor). Use your head: How to unleash the power of your mind. London: Pearson, 2010, © 1974.